You are here: Home / News & Advice / 2016 / September / Fantastic Floors - with up to 60% off! Fantastic Floors - with up to 60% off! At Magnet Trade we offer a wide selection of flooring from laminates to vinyl and solid wood to engineered wood. Available in a variety of colours and finishes and now with up to 60% off list prices there hasn't been a better time to buy. We work with premium floor suppliers including Quick-Step and Amtico that are easy to install and easy to team up with any kind of home decor. Right now we are offering you the chance to save 60% off list prices on two popular laminate floors when you spend £750net on Kitchens, and when you do, walk away with a FREE roll of 3mm underlay too. The laminate floors on offer are a choice of our two best sellers: Sherwood Oak and Flint Oak both 8mm thick for high quality performance. Take advantage now when you buy any kitchen for £750net or more. We also have some fantastic savings across Quick-Step and Amtico. Quick-Step Exquisa is available in multiple colour options, we've discounted two of the most popular colour choices Ceramic Light Tile or Slate Dark to just £15.00net /m2. 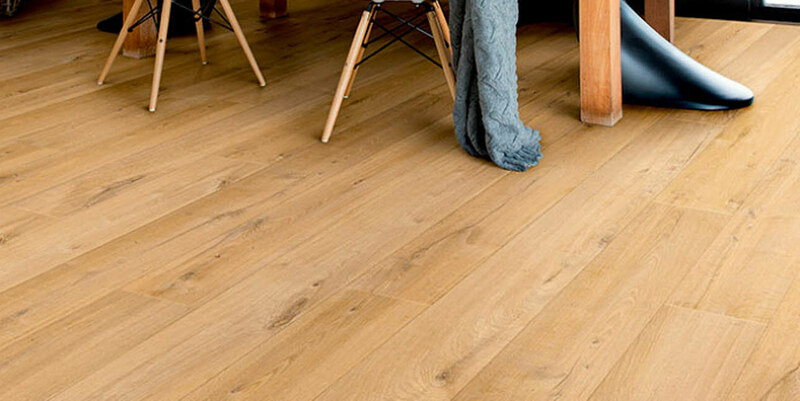 We have also discounted two options from the Quick-Step Impressive range choose between Soft Oak Light or Classic Oak Natural for just £16.00net /m2, all 8mm thick. Amtico Click vinyl flooring is on offer too at £23.50net /m2 for the following colours: Linden Oak Stripwood, Weathered Oak Stripwood, Bottocino Cream Stone and Slate Jet Stone, all 5mm thick. To find out more about our flooring ranges call into your local store or browse our flooring range online today. Terms and conditions: Offers available on purchases made between 30th August 2016 - 26th November 2016. Spend £750net on kitchen furniture in one transaction, excluding end panels, appliances, accessories, sinks and taps and get 60% off 64210400 8mm Light Sherwood Oak or 88680500 8mm Flint Oak flooring plus one free 15m2 roll of 3mm foam underlay per order. Ask in store for full details. All prices shown are exclusive of VAT chargeable at the current 20% rate. Offers cannot be used in conjunction with any other offer. All prices quoted include trade discount. No further discounts available. Offers and products correct at time of publication and may be subject to revision without prior consent. Offers are subject to availability and may vary in individual Magnet Trade stores. Offers are strictly available to Magnet Trade account holders only and do not apply to the supply of contract Kitchens.